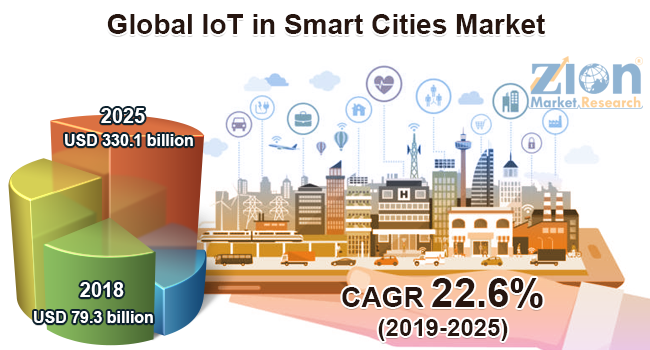 Global IoT in smart cities market expected to reach approximately USD 330.1 billion by 2025, at a CAGR of slightly above 22.6% between 2019 and 2025. In smart cities, IoT provides the perfect platform for uninterrupted communication of data that is generated from smart electronic devices. The report covers a forecast and an analysis for the IoT in smart cities market on a global and regional level. The study provides historical data for 2016, 2017, and 2018 along with a forecast from 2019 to 2025 based on revenue (USD Billion). The study includes drivers and restraints of the IoT in smart cities market along with their impact on the demand over the forecast period. Additionally, the report includes the study of opportunities available in the IoT in smart cities on a global level. This report offers a comprehensive analysis of the global IoT in smart cities market along with market trends, drivers, and restraints. This report includes a detailed competitive scenario and the product portfolio of the key vendors. To understand the competitive landscape in the market, an analysis of Porter’s Five Forces model for the market has also been included. The study encompasses a market attractiveness analysis, wherein all the segments are benchmarked based on their market size, growth rate, and general attractiveness. The global IoT in smart cities market is segmented on the basis of component, application, end-user, and region. The component segment is majorly classified into solution and services. The solution segment includes security, remote monitoring, analytics, network management, and RTLS. By application, the market is classified into lighting, traffic, utilities, public safety, environmental monitoring, and others. By end-user, the market includes information and technology, telecommunication, government, automation, energy, and others. All the segments have been analyzed based on present and future trends and the market is estimated from 2019 to 2025. The regional segmentation includes the current and forecast demand for North America, Europe, Asia Pacific, Latin America, and the Middle East and Africa. Some renowned key players of the global IoT in smart cities market are IBM, Intel, Cisco, Huawei, Hitachi, Quantela, Microsoft, Bosch Software Innovations, Schneider Electric, Tech Mahindra, Sierra Wireless, Siemens, Honeywell, Bosch Software Innovations, ARM, and PTC, among others.